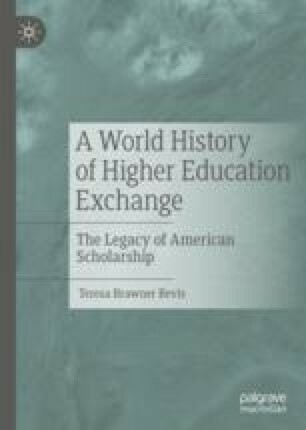 Scientific and curricular advances in the United States, and the elevation of the status of its universities, at first drew scrutiny from European scholars. The new status of American academics had the immediate effect of attracting foreign interest, as countries such as China began to invest in the acquisition of fresh scholarship. Others would follow suit. By the end of the 1800s, colleges and universities in the United States were hosting international students from around the world. Around the same time, America adopted its first immigration policies, among them the Chinese Exclusion Act. It was the first of many such policies that would affect the migration of foreign students to America. Kao, Timothy. 1999. Yung Wing and Young Chinese Students in America 1872–1881. The Chinese Students Memorial Society. www.120students.org.